Students will be exposed to many different art styles and get an opportunity to create works in a variety of different mediums including painting, printmaking, drawing, clay, wire sculpture and more! This class meets every Monday from 4:30 – 6:00pm. There is a one-time nonrefundable supply fee of $50 that is due at the first class meeting. Monthly tuition can be submitted as cash or a check made payable to the Monthaven Arts & Cultural Center; supply fees can be submitted as cash or a check made payable to the teacher of your child’s class. Spring semester starts January 7th and ends May 20th 2019. Please note there will not be art classes held on any major holidays or Spring Break (March 25-29, 2019) following the Sumner County School calendar. 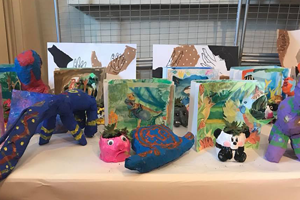 Arts After School classes are once a week throughout the school year, 9 month program, following Sumner County public school calendars, and take place at the Monthaven Arts and Cultural Center in historic Monthaven Mansion. Programs for children ages 6+. Students attend class once a week from 4:30-6:00pm. Tuition per month is $50 per student with a one time non renewable supply fee of $50. Arts After School will produce a small reception for the children to showcase their masterpieces to family. We’ll have light snacks and beverages and will emulate a real professional art show. This is a great opportunity for the children to communicate detailed concepts they developed and implemented in their works to others. I understand that supervision will be provided during class hours. I release any person working in this program and agree to indemnify and hold harmless the City of Hendersonville, Monthaven Mansion, Monthaven Arts and Cultural Center, its staff, board members and all other persons involved with the program for any liability they have to me or my child for any injury received by my child while participating in this program. I agree to pay the tuition of $50/month at the beginning of each month that my child is enrolled, as well as a one time non-refundable supply fee due at the first day of class. I also agree to pick up my child promptly after each class. Failure can result in the child’s dismissal from the program and additional charges. I understand that the Arts After School Program follows the Sumner County School calendar, meaning anytime that school is canceled, so are art classes. Make-up classes are scheduled for all cancellations excluding the observance of federal holidays. With my signature, I have read and agree with all of the above.